Check our compatibility guide if you want to know whether Acrolinx for Arbortext works with your local platforms. With Acrolinx for Arbortext, you can include content quality checks into your workflow. Acrolinx for Arbortext checks content from both Edit View and Document Map views in Arbortext Editor. Acrolinx for Arbortext supports DITA map checks. When you check a DITA map, you get a lighter version of the Sidebar. The cards give you all the information you need to correct your content. But Acrolinx doesn't highlight issues in the text and doesn't replace issues for you. You can use all the other features of the Sidebar, and edit your issues directly by opening the individual files. Your Acrolinx administrator can extend the file types that Acrolinx checks. See the article How to Configure Acrolinx to Recognize Your File Type to learn more. How can I install, uninstall, or update Acrolinx for Arbortext? You'll need administrator rights for your operating system to complete some of these steps. Download the Acrolinx for Arbortext .msi file from your company download area, or get it from your Acrolinx administrator. Close any open instances of Arbortext Editor. Double-click the .msi file and follow the installer instructions. Uninstall Acrolinx for Arbortext like any other Windows program. To update Acrolinx for Arbortext, simply install the new version (as described above). Once you've installed Acrolinx for Arbortext, an Acrolinx menu will appear in your Arbortext Editor toolbar, as well as a button in your ribbon. You can use either of these to open the Sidebar. 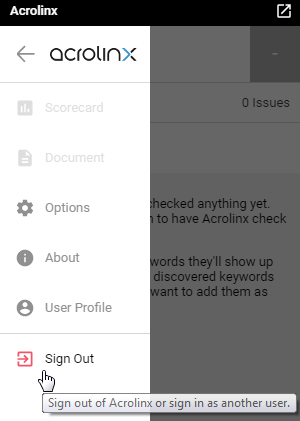 Note: Before you can use the Sidebar, you might need to enter your Acrolinx address. If you don't know your Acrolinx address, ask your Acrolinx administrator. How do I check a selection of my content? Acrolinx for Arbortext can check a selected section of your content. Select some content in Arbortext Editor by highlighting it with your cursor. Click CHECK SELECTION in your Sidebar. You can find it in the drop-down menu next to the CHECK button. Voila! The Sidebar will only show you cards for the content you've selected. Does my check data get embedded in my document? If your Acrolinx administrator enables embed check data on your Acrolinx Core Platform, Acrolinx saves check data as a processing instruction at the end of your XML document. Check data is not embedded into HTML documents. acrolinxCheckData score="82" scorecardUrl="<SERVER_ADDRESS>/output/en/gear_pump_xhtml_admin_38616c5a5ff3e6fe_1_report.xml" timeStarted="2017-10-10T06:24:03Z" status="green"
To learn more about activating and using the embed check data function, see our article on Embed Check Data for Sidebar Edition Integrations . By default, the Sidebar appears in English. If your Arbortext Editor language is German, French, Japanese, or Swedish, then your Sidebar will also appear in this language. What does the Acrolinx Administrator need to do? If you use the MSI installer properties to automate the installation of Acrolinx for Arbortext, you can now also specify your Acrolinx address. This means writers don't have to enter this information themselves. To set your Acrolinx address, use the property ACROLINX_SERVER_ADDRESS. ACROLINX_SERVER_ADDRESS Specify the Acrolinx address. Note: This property works for first-time installations only. The property gets ignored during an update and whichever server address is currently configured gets used instead. For more information on using the Sidebar, take a look at the article Get Started With the Sidebar .